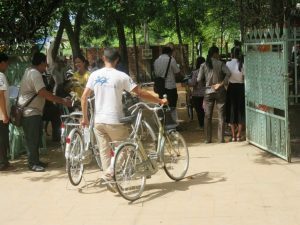 Hundreds Of Bikes For Our Siem Reap Women! Having your own transport, such as a bike, is at once both liberating and empowering, particularly if you live in a remote or inaccessible location. However, what if you simply cannot afford that as an option? Very often a lack of access to personal transport can prove another important factor that leads to individuals being marginalized – if you can’t travel around easily, your horizons, and therefore your opportunities, can be very limited indeed. 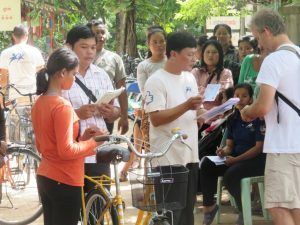 So our Kaliyan Mith team in Siem Reap were particularly delighted when on 21st and 22nd July, they received a second visit from the amazing folks at 88bikes , a Foundation launched in 2006 which endows bikes to girls and women, particularly those who have been, or are at risk of being, trafficked. 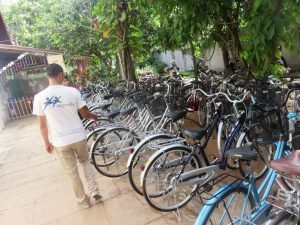 The Foundation very kindly donated hundreds of bikes to women from our Kaliyan Mith Siem Reap program in Cambodia, on this their second visit to this program. Over two days, 246 young women and girls from across our school reintegration, vocational training, family reintegration and community outreach projects received a free bicycle. It was really great for us to partner with 88bikes again, and truly fantastic to see the young people cycling away from the handover with their new found independence very obvious! Even little brothers got in on the act! Protect All Children. Migrants Too. The Milk Of Human Kindness?? 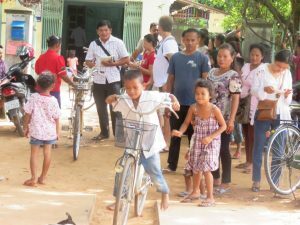 The Siem Reap Baby Milk Scam. Andong Fathers On The Big Screen(s)! Street Children, Free Meals, & Lessons Learned. Friends-International Blog © 2019. All Rights Reserved.